Sharp spines, green scales and a bright mane resembling an exotic flower – if you see these features, you know you're looking at a Cactus Dragon. In spite of its spiky appearance, these dragons' have a very gentle personality. They make for very loyal and reliable friends. How to Breed Cactus Dragon? 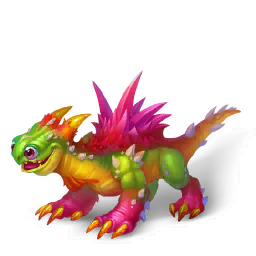 Find out how to breed Cactus dragon with the How to Breed Calculator!